OLYMPIA—On Thursday night, the House of Representatives passed a $4.18 billion-investment capital budget on a 95-1 vote. SB 6090 includes a record $1 billion to build new public schools, a key provision to help school districts reduce K-3 class sizes, as well as $800 million in projects at colleges and universities across the state. In all, the budget will generate an estimated 75,000 jobs in construction, engineering and natural resources over the next four years. “Every child in Washington should attend a good school, every family should have access to living-wage jobs and every community a strong infrastructure, this bipartisan budget includes funding for projects that address these needs in every corner of the state,” said Rep. Tina Orwall, D-Des Moines. 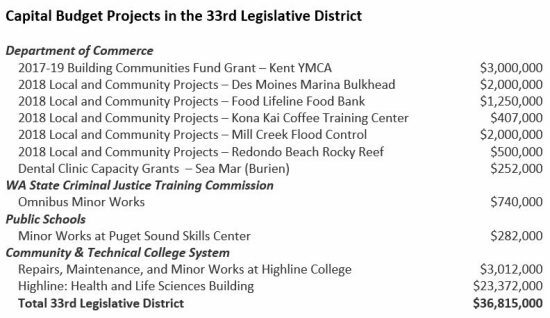 “The capital budget is an investment in our local communities, which includes putting local people to work on projects that we all care about,” said Rep. Mia Gregerson, D-SeaTac. The capital budget pays for buying, building and repairing infrastructure projects including schools, parks, community centers, clean air and water systems, corrections facilities, hospitals, clinics, housing and higher education facilities, among others.